Kulman Ghising (left), Managing Director for the Nepal Electricity Authority, and David Molden (right), Director General of ICIMOD cut a red ribbon to inaugurate ICIMOD’s solar energy system. The International Centre for Integrated Mountain Development (ICIMOD) and the Nepal Electricity Authority (NEA) formally inaugurated a solar energy system at ICIMOD headquarters this afternoon. The system employs a net metering system, which enables ICIMOD to send its excess solar energy to the national grid especially during the weekends. ICIMOD currently has 92kWp installed capacity for photovoltaic solar energy on its campus in Khumaltar. Another 60kWp will be added when the new annex building opens in early 2018. 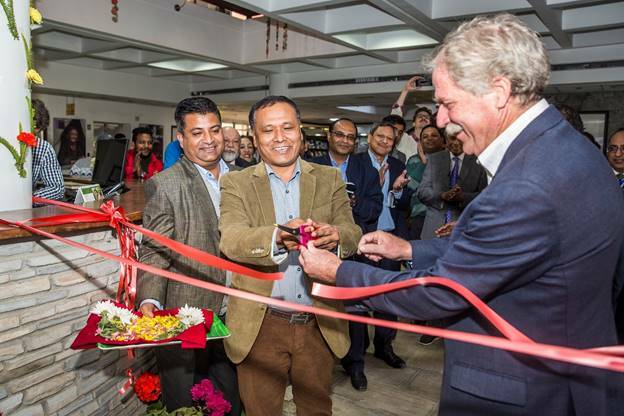 ICIMOD’s director general, David Molden, and NEA’s managing director, Kulman Ghising, cut the red ribbon strung up before a plasma display that shows ICIMOD’s solar energy output in real time. ICIMOD is the first organization outside the Nepali government to use a net metering system to send solar electricity into the national grid. Molden said he hoped more institutions would adopt this practice as it can be easily replicated and promotes a smart and sustainable option for meeting future energy demands. The inauguration took place on the first day of a workshop focusing on hydropower collaboration and electricity trade in South Asia, organized by ICIMOD and the National University of Singapore.